Popular Japanese messaging service LINE has continued charting its way upwards in terms of revenue brought in by in-game purchases, sticker purchases and other areas such as official accounts and sponsored stickers. Despite being a free app, it was revealed today that Line brought in 34.3 billion yen ($338 million) of revenue for its parent company throughout the whole year of 2013, after chalking up 12.2 billion yen ($120 million) of revenue in the fourth quarter. That’s a 20 percent increase over the previous quarter and a 450 percent increase over the same quarter in the previous year. In the meantime, Line Corporation — which includes other businesses such as Line Plus Corporation, Line Business Partners Corporation and DataHotel Co. — had a total annual revenue of 51.8 billion ($510 million) in 2013. Considering that Twitter, as a much bigger company with 241 million monthly active users, just revealed that it generated $242.7 million in revenue for the fourth quarter, Line’s financial figures are pretty impressive. Through efforts such as the release of stickers featuring popular soccer stars in Mexico and the cultural highlights of Diwali, a major festival in India, the stickers business concentrated on producing highly localized products and was successful in further entrenching the culture of sticker communication in markets across the world. It seems like stickers are but the first step for Line moving into any market. Line Corporation says that the increase in net sales for its messaging app are mainly due to in-game purchases — which make up about 60 percent of revenue. That’s followed by sticker purchases, which account for 20 percent of revenue, as well as official accounts and sponsored stickers. Line doesn’t provide active user numbers, so it’s tough to directly compare to its rival messaging services WhatsApp — with 350 million monthly active users — or WeChat with 280 million active monthly users. 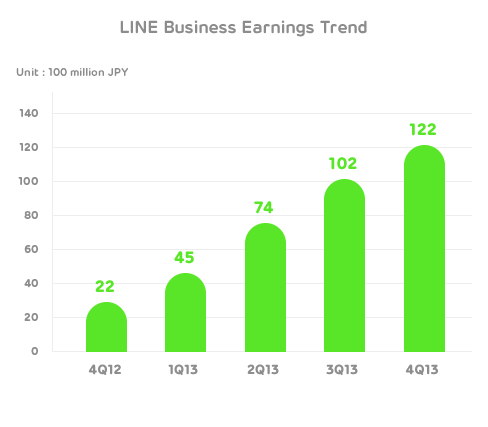 However, it seems clear that Line has settled comfortably into a content-driven recipe for bringing in revenue — though it must be noted that Line isn’t revealing profit/loss so the company is probably spending a bomb trying to grow too.